Following on from the success of both the Aldine History of Queensland and the Aldine History of New South Wales, South Australia was next for W. Frederic Morrison. 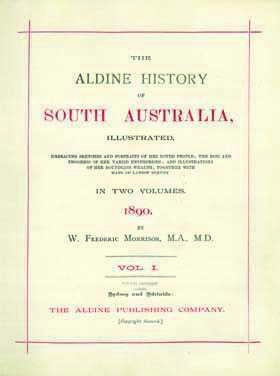 Published in 1890 in two volumes which total over 1000 pages, these rare volumes contain a comprehensive and well illustrated record of South Australia at the time. This valuable genealogy resource of South Australian history and biographies is a must for all with an interest in the early history of this colony and the families represented, or for anyone exploring their family history and building a family tree.